The view from Horne’s front porch is bleak: a weedy lot, the dark, gutted house of a dead neighbor, and beyond that, a derelict affordable-housing development stretching as far as the eye can see. Occasionally, a bird swoops in or out of a broken window. A ripped chain-link fence borders the development, which never reopened after Hurricane Katrina. After Katrina, Horne used a state grant to rebuild her tidy ranch-style house from the ground up. For reasons both emotional and financial, she never seriously considered not doing so. “We don’t have any other place,” she says quietly. “This is where I raised my children. We can’t afford to go anywhere else.” But others with more options also continue to attract government grants to properties that are almost certain to be bulldozed eventually. Upon her return, she installed a jungle gym in the backyard and inside, a plush sofa with plenty of room for chatting with the neighbors she expected would return. They haven’t. The population of the Upper 9th Ward’s Desire neighborhood has dropped 68 percent since 2000, falling from 3,791 to 1,213 in 2010, U.S. census data analyzed by GCR & Associates shows. Where there were once occupied homes, weeds grow. The only commercial establishment within miles is the Money and Honey One Stop, a concrete-fronted corner store with unpredictable hours and an inventory heavy on 99-cent soda and potato chips. Though New Orleans Mayor Mitch Landrieu’s recovery plan includes putting an $11 million community center and health clinic in the neighborhood, the only city project to be completed so far is a modestly outfitted park with a small swimming pool, a few sports fields and a donated Kaboom playground. On warm evenings, the sound of children playing football reverberates through otherwise quiet streets. The view from Price’s front stoop pretty well matches the bleak scenarios laid out shortly after Katrina by urban planners. In the months after the storm, experts from the Urban Land Institute — a Washington DC-based urban-planning think tank invited by then-mayor Ray Nagin to advise his Bring New Orleans Back Commission — warned that without a coordinated strategy for rebuilding neighborhoods in sync with repopulation trends, those areas that lost large numbers of households would fall victim to “the jack o’ lantern effect”: gap-toothed redevelopment in which occupied homes would be surrounded by swaths of blight and abandonment. Instead, the planners recommended transforming hard-hit areas into green space while concentrating rebuilding efforts in the city’s less-damaged core, but residents recoiled. On a now infamous map rolled out at a commission hearing, Horne’s neighborhood, along with other parts of the Lower 9th Ward and Eastern New Orleans showed up as a green dot. The dots reflected depth of flooding, some of it in wealthier, whiter neighborhoods like Lakefront and Broadmoor, but with so much of it concentrated in largely black neighborhoods, cries arose that the redevelopment proposal was a plot to keep black homeowners from returning to New Orleans. Overnight, the notion that some neighborhoods wouldn’t be rebuilt became racially charged. Nagin, then facing a re-election fight, abandoned his pledge to respect the blue-ribbon commission’s recommendations and began encouraging everyone to rebuild, even in neighborhoods like Horne’s. In fact, weeds had been growing high in Horne’s neighborhood long before the hurricane hit. For more than a decade prior to Katrina, a quieter disaster had been unfolding. In another, spectacularly bad policy decision, low-income housing, both public and private, a community center and an Orleans Parish School Board elementary school had been built atop a 95-acre municipal dump so toxic that it was eventually declared a Superfund site by the Environmental Protection Agency. The officials who made the decision to build Moton Elementary, Shirley Jefferson Community Center and the Press Park public housing development on a dumpsite were not acting in a vacuum. Rather, they were acting in line with the theory that guided urban development across the country throughout much of the the 20th century — the notion that the health of cities depends on sustained growth, particularly housing construction, America’s favorite economic indicator. Welcome to the new normal–where swaths of once bustling city neighborhoods deteriorate behind fences. The circumstances that brought New Orleans’ neighborhoods into their current limbo are a combination of singular events and larger national trends. Many communities around the country currently confront similar fates. For evidence, look to the urban prairies of Detroit; Youngstown, Ohio, and Flint, Mich. In New Orleans, abandonment was brought on by Katrina. In the other cities, it was the slower winds of economic and political change, deindustrialization, the overseas emigration of American manufacturing, the foreclosure crisis, decades of population loss, spending cuts and federal policy changes. Now cities must decide how to proceed: continue to maintain city infrastructure and services in communities too hollowed out to qualify as urban, or simply disinvest and mothball these neighborhoods. President Obama is the first president to bluntly assert that new strategies must be found for communities like Desire where abandoned housing is rife and no one seems interested in repairing or occupying it. Unlike prior administrations that have changed individual programs and hinted at a broader need to reshape the way the federal government supports urban development, Obama’s secretary of Housing and Urban Development, Shaun Donovan, has said from day one that the agency’s entire approach must be transformed to take into account changing economic and environmental considerations as well as a new geography of poverty that has low-income populations, once concentrated in cities, now dispersed across sprawling suburbs. “For generations in America, we have measured success by the number of housing units we are able to construct,” says Kildee, in arguing for a different approach. Kildee has a point. When politicians want to claim an economy is robust they cite the number of housing starts. To demonstrate a community is financially healthy, they cite rising home values. The implicit assumption is that populations will keep pace with the market and that the new housing will be absorbed. It is that assumption that Desire and hundreds of other similarly abandoned communities are now proving catastrophically wrong. In response, HUD has come up with a Sustainable Communities initiative and the Choice Neighborhoods program. Sustainable Communities takes a cross-agency approach to build more cohesive, connected regions in which funding for transit is better coordinated with housing development and job growth. Choice Neighborhoods seeks to transform isolated public housing developments into integrated, mixed-income neighborhoods. But those changes are taking place in a context of drastically reduced federal support for cities and housing. Despite Obama’s commitment to rethinking cities, HUD’s budget was slashed 9 percent to $37 billion, the largest reduction in funding of any major federal agency. Adjusted for inflation, the total is lower than any HUD budget since 2003, according to the Center on Budget and Policy Priorities. The spending package includes an 8 percent cut to the capital fund for public housing—a reduction that could have grave implications for already overburdened housing agencies. In the Upper 9th Ward alone, the Housing Authority of New Orleans manages at least a half-dozen abandoned or partially abandoned complexes, including the Press Park subdivision visible from Bernice Horne’s porch. Adding to the challenge: a nearly 40 percent cut to HUD’s largest affordable-housing block grant program, the HOME program, which provides municipalities with grants for affordable housing or direct rental assistance. A smaller but still sizable 6 percent reduction hit the agency’s most flexible community redevelopment tool, the Community Development Block Grant program. CDBG grants provide funding for the sort of neighborhood-level intervention needed to clean up the messy blocks surrounding Horne’s home. “Every local housing authority is going to be picking up the pieces and absolutely funding only its highest priority communities,” says Linda Couch, a senior policy analyst at the National Low Income Housing Coalition. But as budget cuts and political pressures force triage, what happens to those neighborhoods that wind up on the wrong side of the red line? If New Orleans is “the city care forgot,” Desire is the neighborhood care ignored. Built on drained swampland west of the Industrial Canal, the neighborhood grew up alongside a dump where refuse was burned in open pits from 1909 until 1948, when neighbors’ complaints about thick, putrid smoke forced legislation barring dumps inside the city. Instead of abandoning the dump altogether, city officials circumvented the legislation by converting it into a landfill. Burying the refuse underground was seen as more sanitary, an argument that ignored leaching and other forms of chemical pollution. The Agriculture Street Landfill persisted until 1965 when it was last used an emergency dump for debris from Hurricane Betsy. Soon after the landfill closed, the local housing authority began eyeing the unused city land for affordable housing. In 1969, the first of two federally financed developments, Press Park and Gordon Plaza, rose on above the landfill. Though project engineers worried about subsidence, politics quickly trumped environmental concerns. Throughout the 20th century, new neighborhoods were built over the Agriculture Street landfill with no thought to the toxins under the ground. In a desegregating city where much of the housing available to black families was substandard, the idea of building a modern housing development from the ground up— even if that ground were contaminated—appealed to the city’s leadership. No remediation of the contaminated soils was attempted. HANO began to aggressively market Press Park’s new, affordable townhouses to striving black families, instituting programs that allowed low-income public housing residents to become homeowners. Gordon Plaza sprang up on the former landfill’s eastern edge in the late 1970s. Containing homes for senior citizens, rentals and affordable single-family homes, the development was, like Press Park, paid for with federal grants and loans. The strategy reflected the modus operandi of the city at the time: build more and build cheap. Over several decades, the strategy transformed previously undeveloped, drained swampland in the 9th Ward and farther east — areas now synonymous with Katrina’s devastation —into an area dense with federally subsidized affordable housing, populated overwhelmingly by black families. Following the families into new neighborhoods, the Orleans Parish School Board went on a construction spree. Even before Moton Elementary opened in 1985 on the edge of the landfill, elevated lead levels in playground soils led school officials to contemplate abandoning it. Again, pressure for a ribbon cutting won out. The school opened. By the time of the 1990 census, about 1,000 people lived on the landfill or along its immediate periphery. But while the population continued to grow so did concerns about the area’s environmental safety. People were finding stray landfill debris in their yards. The Environmental Protection Agency, which according to legal documents had found evidence of contamination as early as 1986, came down again in 1993 to do testing that found higher-than-allowed levels of lead, arsenic and polychlorinated aromatic hydrocarbons. 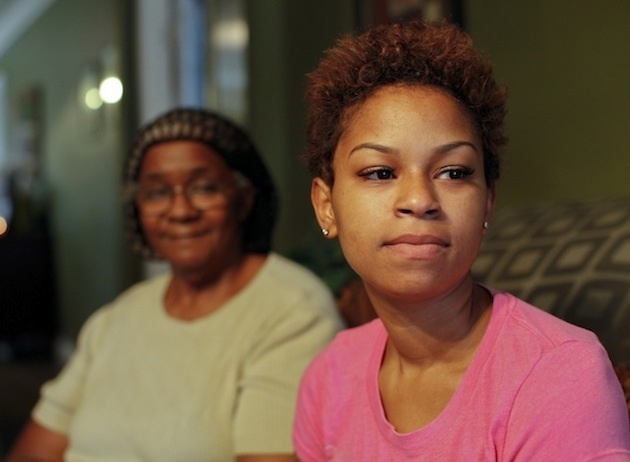 In 1994, Moton, located across the street from Press Park was closed, and Horne’s granddaughter Erica, then a Moton first- grader, tested positive for lead poisoning. “Around that time, we stopped growing vegetables in our garden because we were worried about what was in the soil,” Gordon Plaza homeowner Ruth Parker says. That same year, the EPA recognized the 95-acre Agriculture Street Landfill site as a Superfund hazardous waste site. Though many homeowners urged EPA officials to buy their homes and clear the land, the EPA decided on a cheaper fix: removing contaminated soil and replacing it with clean clay atop a fabric liner. The soil remediation cost $42.8 million and took nine years, wrapping in 2003, but the site remains on the Superfund list. Last year, a non-practicing attorney in Houston named Robert Spencer bought the largest vacant Gordon Plaza tract for $1 from HUD. The property’s previous owner, Desire Community Housing, had defaulted on a HUD loan, leaving the federal agency to foreclose on the 2.6-acre property and auction it off. Spencer, who has said that redeveloping the complex would be his largest project to date, was the only bidder. He has made little progress on the site since buying it in May, neighbors say. Despite loud complaints from these nearby residents, Spencer has filed no permits for the demolition of the blighted housing, a fire hazard. Meanwhile, HANO maintains that it can’t demolish Press Park until it buys out 67 private townhouse owners within its 237-unit development. It can’t do that until the courts resolve the class-action suit, officials say. Neighbors impatiently wait for the wrecking ball. It’s not hard to see why. Walk in through breaches in Press Park’s chain-link border and you will find apartments with moldy, water-damaged pictures on the wall and toys on the floor, crusted in six years worth of dirt. Water from leaking sewerage and water pipes pools in the overgrowth, leaving a faint aroma. At community meetings, residents blame HANO for failing to take cleanup action that could inspire private owners like Spencer to get moving. Further complicating matters, the federal government continues to invest in Press Park and the struggling blocks that surround it. Since Katrina, HUD has sent about $9.3 million in Road Home hurricane recovery grants to remaining owners of the 1,137 housing units included in the census tract that includes Press Park’s 237 apartments, Louisiana Office of Community Development records show. On a warm Tuesday in October, one of those grant recipients, John Spears, climbed through an opening he cut in the development’s fence and showed a reporter the townhouse-style condo he restored using a $70,000 Road Home Small Rental Program grant from the state community development office. Buckets of white paint and Spackle litter the otherwise empty, three-bedroom unit. In an upstairs room, a brand-new plastic-framed window looks out over the development’s deserted, trash-strewn inner-courtyard. If you forget about Katrina, it looks like the set for a dystopian horror movie about a low-end suburb depopulated by a deadly pathogen. In order to receive the $46,000 in grant money the state awarded Spears for completing the affordable housing rehab, he had to show the unit to an inspector, he said. “The inspector said, ‘I don’t see anything else around here. Why would you redo it,’” Spears recalled, tapping his foot on a glossy, adobe-colored floor tile. The question, however on-point, didn’t stop the landlord from receiving his grant money or a certificate of occupancy from the city. Now he is waiting for a tenant to agree to move in so he can receive the final $24,000 installment of the grant allocation. He’s shown the place to a few Section 8 voucher holders but no one has taken up the lease, he said. In a recent interview, the HUD-appointed administrative receiver who runs HANO, David Gilmore, acknowledged that he has met with Spears but declined to talk about his specific situation. “We’re trying to buy everyone out,” Gilmore said. While Spears is the only recipient of Road Home money that has actually completed a renovation within Press Park, there could be dozens more who received grant money to fix storm-damaged units that are now slated to be demolished. This means that taxpayer money will be spent twice on the same housing units, first to repair it, then to tear it down. Gilmore said that while FEMA will eventually pay for the demolition of the Katrina-battered complex, redevelopment is years off. “I don’t have any plans at the moment. That doesn’t mean there won’t be,” said Gilmore, who was sent from HUD’s Washington office to clean up and modernize the long-troubled housing authority put under federal receivership in 2002. Developing Press Park into anything other than an open field will be tricky. Federal regulations prohibit using HUD housing grants on Superfund sites, meaning that HANO would have to transfer the property to a private owner if it wanted to see housing developed there. Beyond that, the notion of rebuilding a neighborhood on a landfill in a far-off section of the city with few public services contradicts the essence of Obama’s holistic, cross-agency Sustainable Communities agenda. For HANO, the rethinking of federal housing policy coincided with its own controversial transformation. After Katrina, the agency never reopened its four largest, traditional public housing complexes, instead implementing HOPE VI programs that turn traditional public housing into smaller, mixed-income communities operated by private developers. The projects, which housing officials expect to complete in the next two years, reflect HUD’s reorientation towards mixed-income, mixed-use communities located in urban cores and connected to public services. One of them, Harmony Oaks in Central City (formerly C.J. Peete), features wrap-around tenant services in a new community center. A cross-city greenway has been incorporated into the design of another development, the old Lafitte complex, now called Faubourg Lafitte. The master plan for a third, Columbia Parc (formerly the St.Bernard complex), includes a revenue-generating golf course. But while residents are publicly enthusiastic about amenities in the new developments, their shrunken size and mixed-income portfolio means that many of the neediest pre-Katrina tenants remain locked out of the modern offerings. Before Hurricane Katrina, HANO had 5,100 occupied housing-development units and 8,500 vouchers, for a total of 13,600 units. HANO now plans to provide 22,500 households with assistance, but nearly 80 percent of families will receive the housing subsidy in the form of a Section 8 voucher, according to the agency’s 2012 budget. The number living in traditional public housing will have fallen by 20 percent. Again following federal policy trends, HANO has traded thousands of public housing units for a market-based voucher system that the agency hopes will encourage people to move into privately owned units, thus de-concentrating poverty. The agency does not specifically track whether such a de-concentration is occurring, making it tough to evaluate the policy’s success. Available data suggests the policy implementation has a ways to go: A 2010 analysis of census-tract level data shows that most of the houses that are approved for voucher usage are located in low-income neighborhoods, within close proximity to the former housing projects. In addition to the tens of millions of dollars going to complete developments shuttered after Katrina, HANO last year took on another high-profile project — the redevelopment of Iberville, the city’s last major traditional public housing development, and the only one located in touristy downtown New Orleans. HUD selected Iberville as one of five developments to receive federal support through Choice Neighborhoods. Its reinvention as a mixed-use, mixed-income neighborhood will cost upwards of $600 million over the next decade of planning and construction, $30 million of which will come from the Choice grant. A successful transformation of Iberville carries huge political potential for the city’s leadership as well as for Obama, who has highlighted the community in speeches about the power of Choice Neighborhoods to reinvent American cities. Unlike the Press Park section of Desire, which is separated from New Orleans’ downtown core by railroad tracks, a smoggy stretch of industrial businesses and the Interstate, Iberville can’t be ignored. Gilmore admits that even if Press Park were his top priority, it would not qualify for the federal support Iberville is getting. “It just would not satisfy the vast array of issues Choice Neighborhoods takes into account,” he says. Kildee, a Democrat who has announced he will run this year for a U.S. House seat from Flint, Mich., his hometown, has made a name for himself as a leader in the burgeoning “Shrinking Cities” movement. Kildee’s mission is to align the size of cities with their population, creating smaller cities wherein resources and services can be better targeted. A consultant to municipalities around the country, Kildee has advised the New Orleans Redevelopment Authority and stationed an outpost for his organization’s Vacant Properties Campaign in the city. In June, the organization will hold a conference here. Kildee acknowledges that Johnson is right. There will be losers. This report is published in partnership with City Limits, a national urban affairs journal. Two years after House Speaker Jim Tucker (R-Algiers) pushed for a moratorium on state subsidies for affordable housing, a board he sits on has awarded $10 million in state-backed approved bond money so a nonprofit can buy an apartment complex Tucker owns.